A few years ago, I came across Jimmie’s Chipotle Pepper Jam at a Farmer’s Market in Los Angeles. Since I adore anything spicy, I decided to give it a try, and I am SO glad I did!! This amazingly flavorful spicy pepper jam has so many uses…as a sauce in stir fry recipes, a glaze for chicken or lamb, a topping for crackers, a spicy companion for cheese, or my personal favorite – on top of some cream cheese on a baguette. It has a sweet, tangy smoky flavor with a lot of heat and it is DELICIOUS. I don’t know who Jimmie is, but if he is the man behind this Jimmie’s Chipotle Jam, I would consider leaving my husband for him. 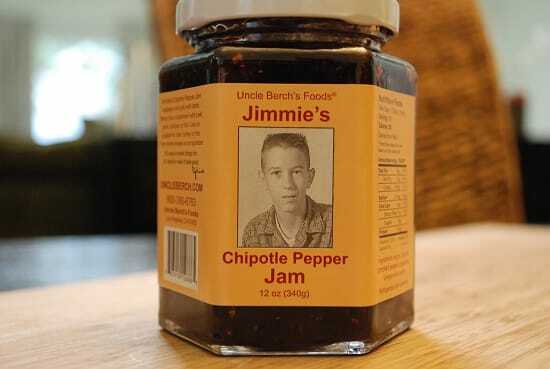 Produced by hand and with all natural ingredients in their Southern California kitchen, Jimmie’s Chipotle Pepper Jam is made by Uncle Berch. It has just 4 natural ingredients, no preservatives, artificial colors or flavorings. And each serving is just 1 Point. Since it packs so much flavor, you really don’t need a lot of it. This jam is only available online, or at various Farmer’s Markets across Southern California, so if you want to give it a try, you’ll have to place an order at their online store. If you are located in Southern CA, look for Uncle Berch at your local Farmer’s Markets – if he’s there, you can sample his Jimmie’s Chipotle Pepper Jam along with all of his other amazing products! Yum! this looks wonderful do we know what the sugars are listed on the label?